AR9100 Aerosol is based on Archoil’s patented Potassium Nanoborate lubrication technology which dramatically reduces operating friction, protecting equipment from wear, extending operating life, and reducing energy consumption. Boron lubrication technology was initially developed at the Argonne National Laboratory for the US Dept. of Energy. Representing a ground breaking advance in lubrication technology, boron was demonstrated to greatly enhance lubricity and protection through the formation of a nearly frictionless solid boundary layer IN metal surfaces. Store Archoil AR9100AE in dry conditions. Archoil AR9100AE can be stored for 5 years. Keep opened packaging firmly closed. 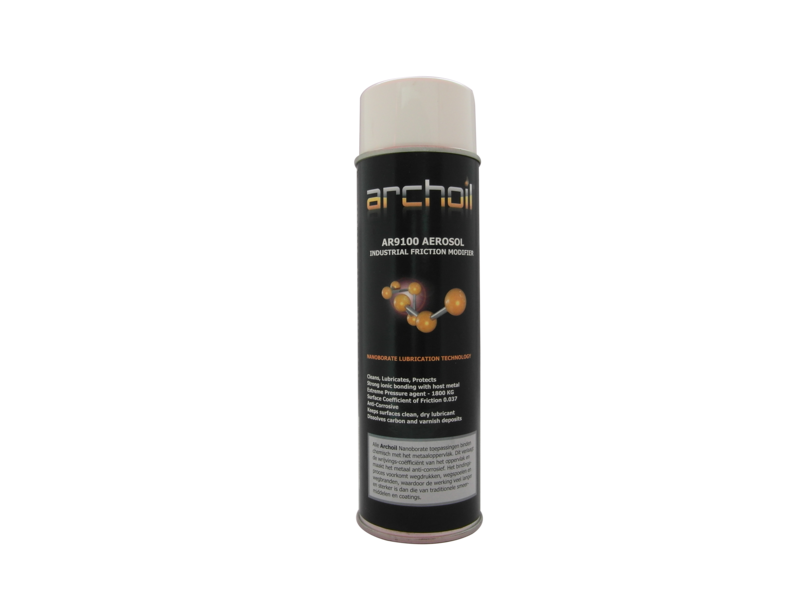 Store Archoil AR9100AE at temperatures between 5° C and 30° C.